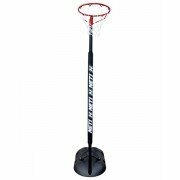 View our range of netball posts and rings from All Rounder Netball. Our posts and rings have been designed so that you can adjust the height to suit playing conditions and junior netball players. The netball bases allow to be anchored to the spot to stop movement during training and games. Our nets are also prepared for any weather situation whether it is the heat of summer or a frosty morning.